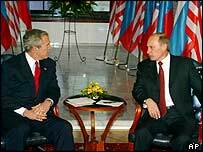 US President George W Bush has told Russian President Vladimir Putin of his "concerns" about Russian democracy. Following talks in the Slovak capital Bratislava, Mr Bush told reporters he had expressed these worries in a "constructive and friendly way". Mr Bush said they agreed that Iran should not have nuclear weapons. The US has concerns about Russian nuclear co-operation with Iran. Mr Putin has said there is no evidence that Iran is seeking nuclear weapons. Washington has repeatedly accused Iran of trying to develop nuclear weapons. It is also concerned about Russian arms sales to Syria. A senior US official speaking to reporters on condition of anonymity, said the summit had not produced any breakthroughs on either issue. At a joint news conference at Bratislava Castle, the two leaders stressed their close ties and agreed to accelerate efforts by Russia to gain entry to the World Trade Organization. However, the BBC's Moscow correspondent, Damian Grammaticas, reports that when it comes to the details of the issues they discussed, the two men appear to be on divergent paths. President Putin told reporters that Russia had chosen democracy "independently", not because of pressure from outside. "Any return to totalitarianism would be impossible," he said. But he added that democracy must be adapted to Russian conditions, taking into account "our history and our traditions" - and he said that comparing which of the two countries had more or less democracy was "not the right thing to do". Mr Bush said: "Democracies always reflect a country's culture and customs and I know that. "But they have certain things in common. They have rule of law, and protection of minorities, a free press and a viable political opposition." The meeting with Mr Putin was the final event of a European tour aimed at healing divisions over the Iraq war. Mr Bush is now heading back to Washington. Before the Bratislava summit began, Russia and the US signed a deal to control the spread of shoulder-fired missiles - seen as a growing threat to civilian aircraft. They also agreed on better safeguards of nuclear materials. The US president has been under pressure from some senior US politicians to make it clear to Mr Putin that his friendship with the US is at risk unless he maintains Russian democracy. A senior administration official told journalists travelling with Mr Bush that Mr Putin had recently told the US president that the Russian people had a history of strong tsars, and that they were accustomed to government playing a strong role in their lives. The official said President Bush had rejected that notion. Russian concerns include the increasing US influence in former Soviet republics such as Georgia and Ukraine. 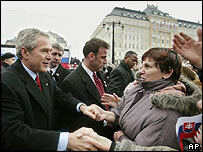 In a speech which correspondents say is likely to have annoyed Russia, Mr Bush addressed Slovaks in a snowy Bratislava square, praising the country's stance as a loyal US ally. Drawing applause from the crowd, Mr Bush praised the 1989 "Velvet Revolution" that defeated communism in the then Czechoslovakia. "In recent times, we have witnessed landmark events in the history of liberty: A Rose Revolution in Georgia, an Orange Revolution in Ukraine, and now a Purple Revolution in Iraq," he said, referring to the voters' ink used in Iraq's recent election. The trip was a success but transatlantic differences remain, says Paul Reynolds. Can Bush mend ties with Europe?